Although grilling weather is almost gone (for some of us, at least), it's the best time to purchase grilling gear, like a BBQ tool belt. 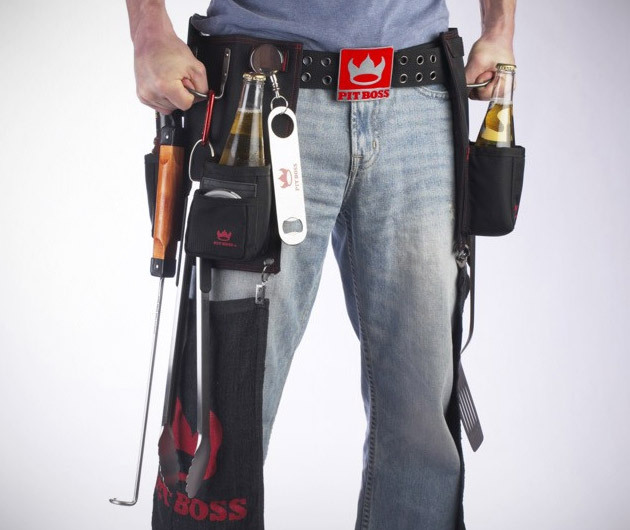 The Pit Boss BBQ Tool Belt ($60) is the perfect gear addition to any grilling or BBQ enthusiast. Featuring a rugged 1680 Denier fabric construction with double-stitched seams, this BBQ tool belt has an obscene amount of storage, including two utility pockets for spices, seasosonings, rubs and sauces, a phone pocket, a die-cast buckle, a Chow Chap leg protection system, two Pit Boss carabineers, two insulated beer pockets, an insulated beer cooler, and of course, a retractable bottle opener. Let's just say if Bruce Wayne owned a BBQ tool belt, this would be it.